Mumbai and London-based, Studio Amita Vikrant uses a unique design language that combines the angular perfection of geometry with the organic forms of nature inspired motifs. 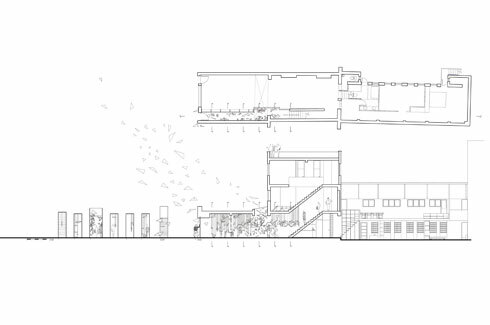 Studio Amita Vikrant (SAV) thinks in terms of spaces. The team usually imagines a whole – functional, solid and compact – and then builds the insides as a contrasting force of fluidity and openness. 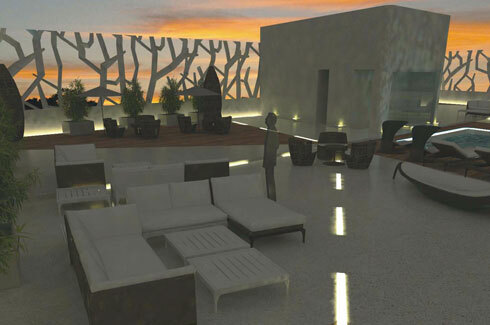 The design inspirations almost always start with the surroundings, and the effort of the team has consistently been to blend and enhance, rather than to obfuscate the pre-existing character of a site. This facet has led to a comprehensive repertoire full of unique experiments with motifs, forms, and materials that will be hard to match. Established in 2009 by Amita Kulkarni and Vikrant Tike, SAV works in the fields of architecture, interior and urban design, and installation art, through offices in both London and Mumbai. The SAV team’s vision is bulwarked by a solid global outlook, but one that recognises the significance of local conditions and visual legacies. The Pune of the present is a city marked by restless concretisation. Like most Indian commercial zones aiming to become metropolises, its boundaries seem to be constantly expanding, and often the first casualty of this growth is the tree cover. Sopan Baug, however, has remained in name and spirit a corner where amongst the bustle of construction, trees still thrive. 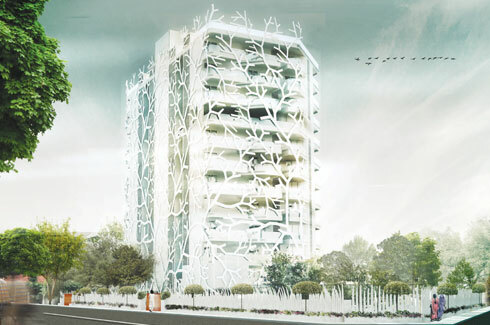 SAV swept this inspiration up and is decking a residential building in the area with an awe-inspiring façade that pays handsome homage to the branching form of trees. The modular, prefabricated façade hugs the structure completely on the south end, and then tapers off moving west and east, finally giving way to large decks with natural greenery planted in them. This fascinating duality of the fabricated and the natural is an aesthetic jackpot, as also a shade against the sun and the playground for some whimsical shadow play within the interiors. 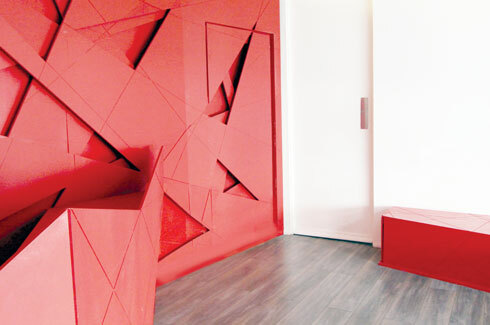 “The components are self-supporting panels measuring 3m x 3m that are fixed directly on the concrete framework. Each of the large panels is derived from a decagon, which can be flipped and mirrored to create a more seamless and free flowing effect, almost like in a tree. These decagons are interspersed with smaller bowtie shaped components that form the smaller links between the larger panels,” the team explains. The visual environment, the artistic eclecticism of Spital Fields in London in this case, is again the fulcrum of the design inspiration. 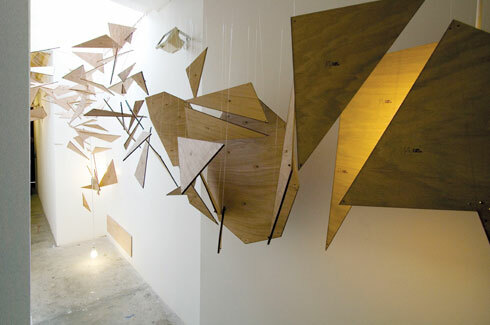 “The design was generated with three interwoven migrating layers – walls, lights and furniture. 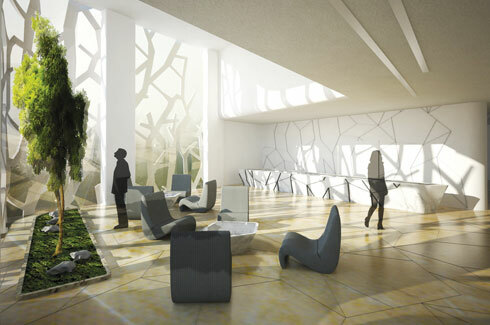 These shape the space, each as an integral part of the migrating interior-scape,” states the team. The shell of the studio remains old, but the partitions within are now 3D and highly movement-oriented, creating thinking spaces that literally do not wish to remain stuck in one place or circumstance. 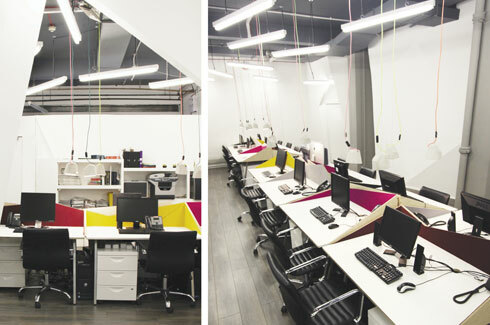 The second layering is of the lights – one being the fluorescent tubes that hover between ceiling and the floor; and the other being the concrete lamps that slide down along their slim and colourful exposed wires to spotlight the work stations. The third design facet is contributed by the furniture; here designed to be individualistic but still part of a wholesome eccentricity. The work desks have CNC fabrication origins and feature colourful origami-shaped divisions that reinforce the separate-but-whole scheme. The dining space comes forth in similar fashion, with the chairs all slightly different in angles and looks; together these look like a “family of migrating birds.” The Here and Now 365 Media Agency in effect looks like it should – full of fluid whimsy, but still disciplined in its design. SAV has a remarkable talent for installation art that aims to bend regular ideas into irregular forms and extracts the abstract out of them. Text Fields, commissioned by and originally located at The Corridor, Shoreditch, London, is one such collaborative research and design project that seeks to explore the complex meeting point between spaces and textual geometry. “TF002 consists of a total of 358 elements that will be constructed by means of custom design, digital scripting and laser-cut materials. Each of the individual components contains information of its original text map, the forces that affected its position, and its serial location within the entire field,” states the team consisting of Kulkarni, Tike, Jerome Rigaud, and Rajat Sodhi. This display was later exhibited at The Aram Gallery in London. In contrast, Binary Fields is a rumination on India’s evolution from an agrarian paradise to an increasingly technology-reliant economy, as well as on the electronic slag that emanates from this shift. 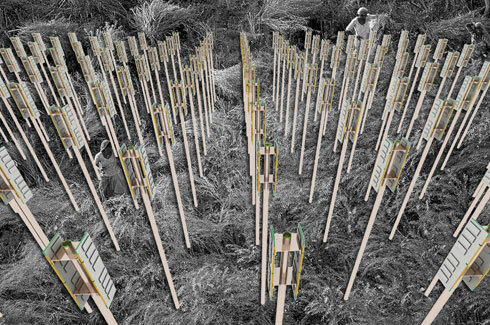 “Binary Fields consist of over 8,000 computer recycled parts forming an interactive green technological field. These parts will be installed on thin hollow metal tubes to create tectonic grass,” states the team. 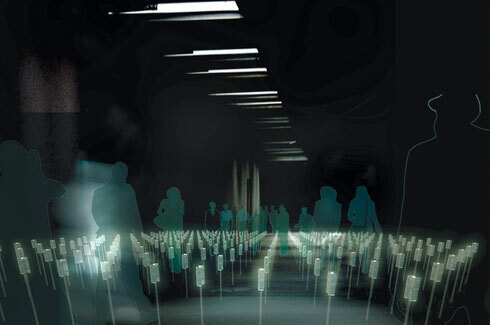 These elements are connected to an LED network that can be activated through motion sensors, thereby allowing visitors to be treated to dynamic ‘light ripples’. The brilliance of both these projects is in the choices that were made in terms of material, form, and performance, to communicate what is one rather intuitive idea, and another an idea oft heard of but scarcely understood with requisite foresight. For a firm like SAV, with its hands dipped in multiple aspects of design, it is a display of a deeply philosophical thought process, and of a prodigious talent for translating complex ideas into art.